If you are serious about making money from matched betting then you will need to be completely familiar with the range of transactions required in different situations. For example, the free bet you are trying to liberate could be a stake-returned or stake-not-returned offer, or it could be straightforward bonus cash added to your opening deposit. However the incentive is structured, you are going to need to calculate without fault the various stakes required for both the bookmaker back bet and the betting exchange lay bet in order to convert the myriad freebies into hard cash without risking anything. There are various tools freely available across the Net and every matched betting connoisseur will have their own personal favourite. We prefer the ‘KISS’ philosophy (Keep It Simple, Stupid) when approaching anything for the first time and our preferred matched betting calculator is in our opinion both the easiest to operate and visually speaking, the easiest to understand at a glance when perhaps speed is of the essence. 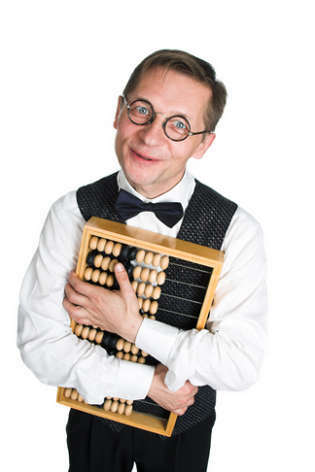 The specialist matched betting site, Freebets4all.com, offers a couple of invaluable tools; we’ll describe their ‘Automatcher’ in Part 5, but for now we will limit our discussion to their matched betting calculator. This is a powerful tool requiring minimal input. The most important thing to remember is to check the correct type of bet at the top of the calculator. Then it’s just a question of filling in the 4 blank fields. The ‘Stake in bookmaker‘ is the ‘initial’ or ‘qualifying’ bet exposure or, the value of the free bet you are trying to cash-in with a profit bet. The ‘Back odds‘ are the bookmaker odds for your chosen event and at which you are going to place the ‘Stake in bookmaker’. The ‘Lay odds‘ are the betting exchange odds for the same event found in sites such as Betfair, Betdaq, Smarkets and WBX. The ‘Exchange commission‘ is the charge levied by the betting exchanges for the privilege of using their trading platform. Betfair and Betdaq tend to charge 5% unless qualifying for lower rates through bonus points or special event offers (Betfair ‘premium charges’ are discussed here). Smarkets is currently offering its service for just 2% commission (although you pay a fee every time you deposit with a card). WBX’s rates vary between 3 and 5% depending upon market strength and loyalty factors. 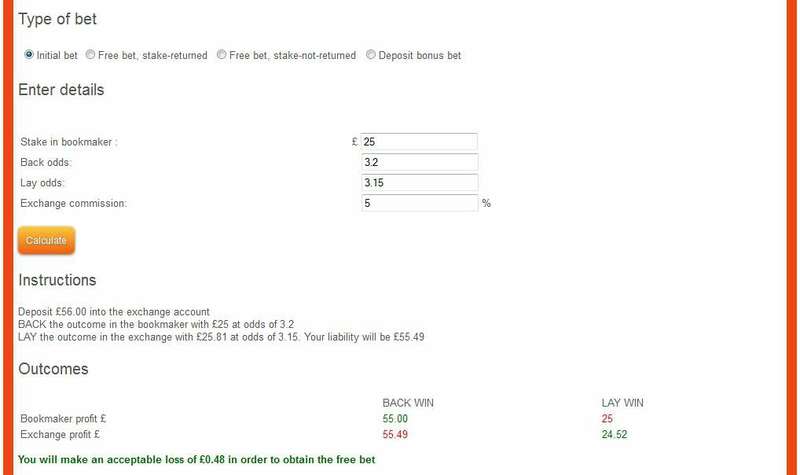 The screenshot shows an ‘initial bet’ or ‘qualifying bet’ example, a transaction you will invariably need to perform many times with different bookmakers in order to earn their free bets. In this example, say we need to make an initial bet with our own money before we can obtain a 100% matched deposit free bet. In this case the free bet we are going after is to the value of £25, which means we need to ‘bet through’ our initial deposit of £25 before the bookmaker credits our account with a free bet of the same amount (i.e. ‘matched’ deposit). Of course, we want to cover the bet so that no money, or as little as possible, is lost in order to earn the free bet for nothing. The calculator shows that our chosen stake of £25 placed at odds of 3.2 wins a total of £55. If we consequently find odds to lay the same outcome in a betting exchange of 3.15 then the calculator tells us to ‘lay’ at a stake of £25.81. The liability of the lay bet is shown as £55.49, which will be covered by the £55 won with the back bet (net loss £0.49). With the exchange commission rate set at 5%, a net £24.52 (£25.81 less 5%) will be won if it is the lay bet which wins; the back bet will lose £25 (net loss £0.48). So, as you can see, whichever bet wins, a small loss will be incurred in order to ‘earn’ the free bet, which we should certainly expect to cash to the tune of at least 75% of its amount. With the aid of Automatchers (see Part 5), it is sometimes possible to find situations where backing both sides of an event in the fashion described above can lead to a profit. This is called arbitrage or an ‘arb’. This is icing on the cake helping to maximise the amount to be made from all of the free bet transactions. Whichever type of bet is chosen, the most advantageous outcome always results from finding lay odds as far below the back odds as possible. We advise you to play around with the calculator and practice with it until employing it in your first matched betting transaction with real money. There are others to be found in the Net but this one provides everything we need in a simple and easy to understand format, which we have not seen elsewhere. Nice guides, thanks for sharing. I came across easy-matched-betting.co.uk who provide all the offers, reloads and guides 100% free. Pretty good if you ask me and might help some folk who are paying. What happen with the 5th part of the thread? What do you mean with 5th part?